Venus is the second closest planet to the sun. Venus is 180 million km away from the sun. One day on Venus (the time taken to rotate on its axis) = 243 Earth days. One year on Venus ( the time taken to go round the sun) = 255 Earth days. So on Venus one year is 1.05 days. 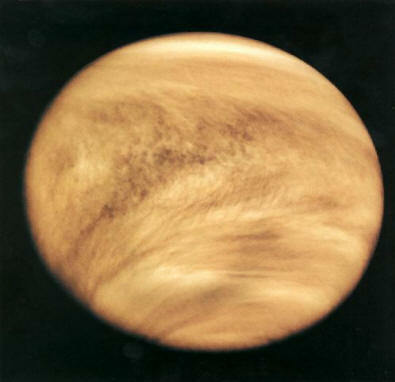 The temperature on Venus is 460°C at all times. Venus spins in the opposite direction to other planets. This means that the sun rises in the west and sets in the east. Venus has been explored by around 40 spacecraft and they have mapped around 98% of its surface. No life forms have been discovered to date.